What can I say about this one? It was a whole lot funnier when it first came out, because, well, nobody thought he had a ghost of a chance to be elected President then, right? Want More Like This? Watch "How the Trump Stole Christmas"
Ricardo Montalbán (1920-2009) was a Mexican-born actor who enjoyed considerable success in the movies and on television beginning in the early 1940s and continuing until shortly before his death. 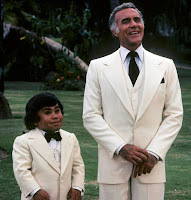 One of the few Mexican-American actors to work pretty much continuously through the 1940s and '50s, Montalbán is perhaps best known for his starring role as Mr. Roarke in the ABC television series Fantasy Island. I like these short holiday messages from various celebrities as they usually make for successful segues from one song to another and break things up pretty well. I especially like the greetings from the one-hit wonder sorts of public figures, mostly for the irony. Unfortunately, my supply is dwindling down to a precious few. I like this clip because Montalbán goes out of the way emphasize his Mexican heritage and ends his holiday message by asking us all to "get well soon." While Montalbán has been dead for seven years and couldn't have imagined the results of this year's election, I'd like to think he's hoping our country recovers quickly and completely from our recent episode of collective mental illness. This is a track I've meant to include on one of my holiday mixes for several of the past dozen years or so and yet never quite did. I'm not sure why I haven't found a spot for it before now, because it's a great version of a beloved classic by an actor I've long enjoyed — Art Carney. This song was actually released as the "B" side of a holiday 45 RPM single titled "Santa and the Doodle-Li-Boop," which was released on the Columbia label in 1954. I've always thought of Carney as an actor, based on his work in The Honeymooners, his Academy Award-winning performance in Harry and Tonto (1974), and his many other roles on television and in the movies. But he also enjoyed considerable success as a recording artist, particularly during the 1950s, when released many albums and singles geared toward younger listeners. This particular song, "'Twas the Night Before Christmas," is based on the classic poem "A Visit from St. Nicholas," which was first published anonymously in 1823 and later attributed to Clement C. Moore. It's not only a holiday classic, but it's largely responsible for the general acceptance of Santa Claus as one of the key characters in the holiday pantheon. The poem has been recorded by hundreds of different artists over the years in a variety of styles, but Carney's version is particularly memorable. A number of critics have lately described it as the "first rap" record, as it was delivered in syncopation and accompanied by only a single jazz drummer. 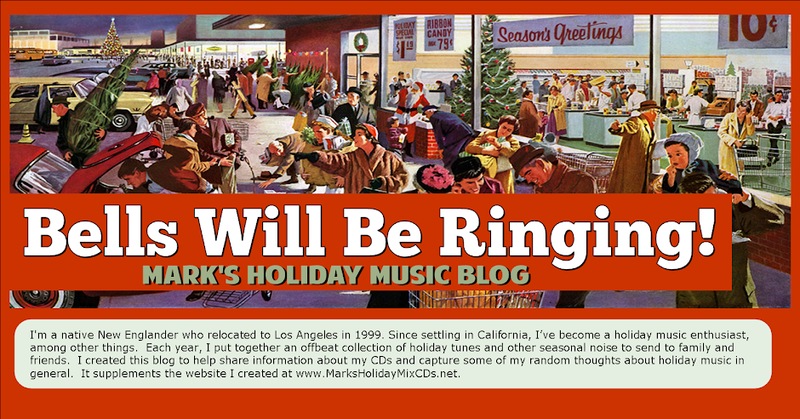 Carney was previously featured in this blog for his role as the department store Santa in "Night of the Meek," a classic holiday episode from the original "Twilight Zone" television series that first aired in 1960. Listen to John Cleese's Version of "'Twas the Night Before Christmas"
Hear Michelle Obama read "'Twas the Night Before Christmas"
Hear President and Mrs. George W. Bush Read "'Twas the Night Before Christmas"
Watch Art Carney in the Honeymooners episode "'Twas the Night Before Christmas"
For the past five years, I've included a number of tracks at the end of each new holiday mix in honor of certain talented entertainers who died during the preceding 12 months. We seem to have lost too many great entertainers this year, including several I was unable to honor for want of a suitable audio clip to include. One change I have made this year is to place the various memorial clips throughout the mix rather than bunching them together at the end. 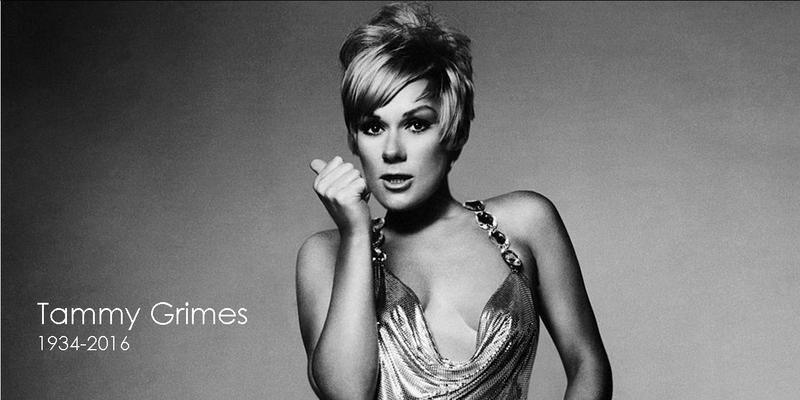 Actress Tammy Grimes died on October 30 at the age of 82. She was well-known in our household as she attended the girls' summer camp my godmother and grandmother ran in New Hampshire when she was a teenager. I knew her best for her role as the successor host to E.G. Marshall on the CBS Radio Mystery Theater, which I listened to as a child and have enjoyed ever since. Grimes enjoyed great success on the stage and in the movies, and I wanted to at least note her passing here. Listen to Tammy Grimes' reading of "'Twas the Night Before Christmas"